From the first to the third sub-district. 清澄一丁目から清澄三丁目. Near the 深川村 Fukagawa village in Edo, 深川清澄町 Fukagawa Kiyosumi Cho. He must have been a man of considerable means because it's said that he financed the filling in and reclamation of the original marshland which effectively gave access to the high ground (where Kiyosumi Park is now located). The details about this family and personage are obscure, but if this tradition is true, these efforts to fill in the swamps would have made the lowlands not only livable, but suitable for business and its hilltop areas desirable for feudal lords serving sankin-kōtai duty. This area was located near rivers which made it good for transporting goods. So the area definitely prospered after the land reclamation and so the name of Kiyosumi Yahē apparently stuck. The area in the beginning of the Edo period was quite a swamp and there soon were eight small fishing villages along the 隅田川 Sumida river. Fukagawa Ryoshimachi Hakkamachi (eight fishing villages in Fukagawa). Yahei became the head of Yahei-machi 弥兵衛町. The fishermen were obliged and privileged to bring their fish and nori 海苔 seaweed to the kitchen of the Shogun. 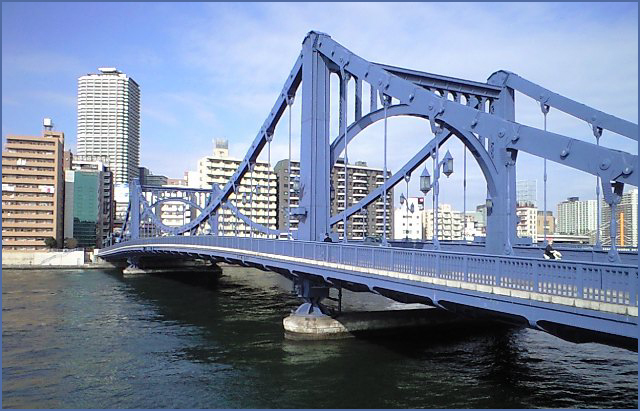 In 1695 the area was re-named to Kiyosumi machi. In 1932, the Chinese characters for Kiyosumi were changed to 清澄町. The grounds of Kiyosumi Teien (清澄庭園) were originally the residence of an Edo era merchant, and eventually changed ownership to a feudal lord who turned them into a garden. During the Meiji Period, the founder of Mitsubishi bought the garden to entertain his guests. 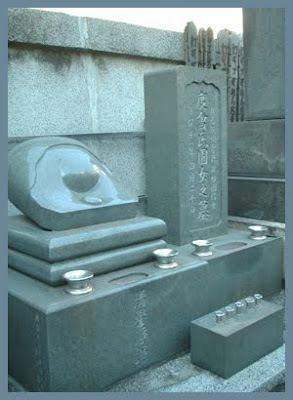 It was donated to the city of Tokyo and opened to the public in 1932.
are the many stones set around the grounds. 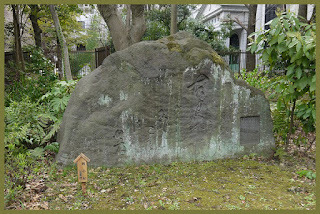 Landscape stones are highly sought after and valuable, and some of the ones in the garden are famous stones that were acquired from all across Japan. be sure to venture across the stepping stone paths that are set in the water. This is called "isowatari", and from the stones you can see fish and turtles under the surface of the pond as well as reflections of the garden in the water. 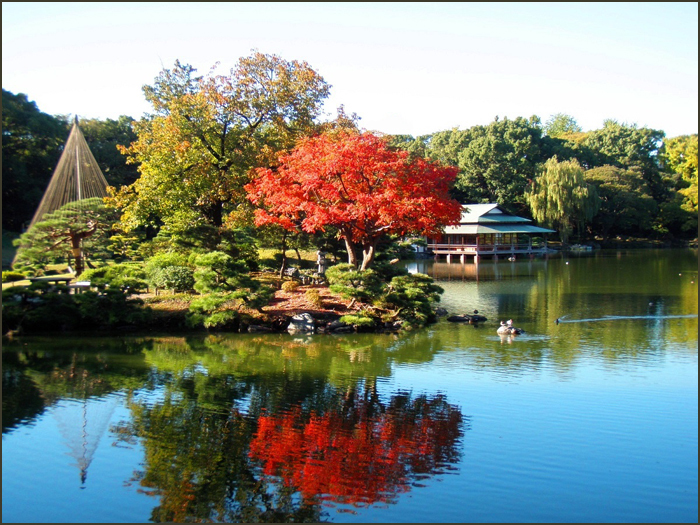 Built in 1950, 22 m long and 12 m wide.
. Kiyosumi Garden Pond and Matsuo Basho . Those fish ponds of course do not exist anymore, but there is a large pond in the Kiyosumi Gardens not far from the Basho Museum. Not surprisingly, one of the three frog-and-pond haiku stones stands right in this garden. In the expectation that this pond will help me to evoke the proper atmosphere I proceed to the Kiyosumi Gardens.
. Shiba Sonome 斯波園女 (1664 - 1726) . In 1690, Sonome became a student of Matsuo Basho. Her correspondence with Basho is quite well loved. at the temple 雄松院 Oshoin . the Daimyo of 陸奥国白河藩 the Shirakawa domaine in Mutsu (Tohoku). The first temple had been on 霊巌島 Reiganjima island, but was lost in 1657 during the great fire of Meireki. The temple was relocated to its present place.
. 松平定信 Matsudaira Sadanobu (1758 - 1829).
. Matsuo Basho at Shirakawa no Seki 白川の関 . Since the completion of the station 清澄白河駅 Kiyosumi Shirakawa Eki the area prospered ever more. There are remarkable pieces of sparkling Silver art on the walls. is a community culture center that was established in 1986. 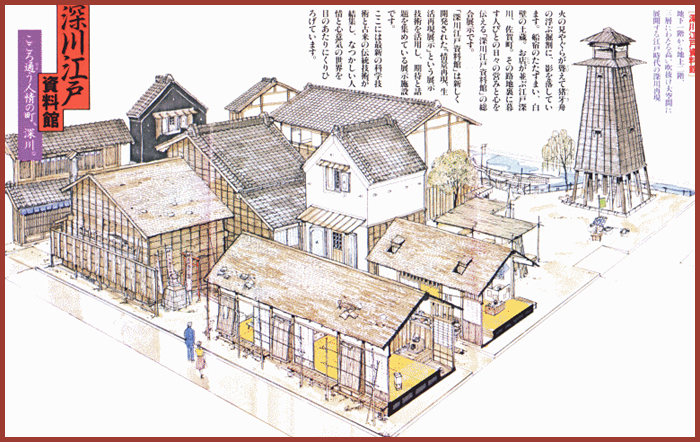 It has an Edo period display of reconstructed Fukagawa Saga-cho houses as well as a small theater and a lecture hall, coupled with the Shirakawa branch of Koto-ku administrative office. 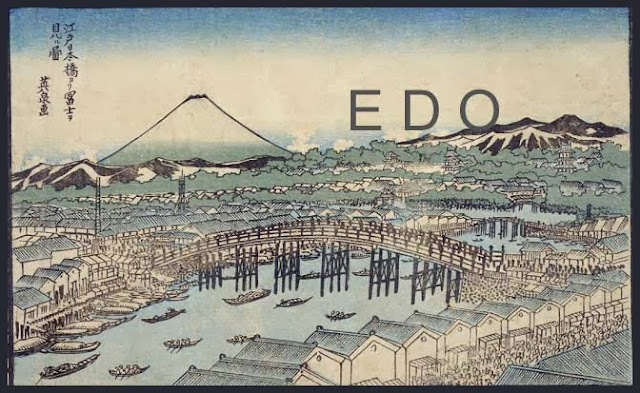 Since its opening, the center has held exhibitions regarding the history of Edo Fukagawa and has provided space for many cultural activities.
. Kōtō 江東区 Koto ward, "East River" .